Stay tuned for upcoming events for Hit Onam 2017 in near future. K.S. 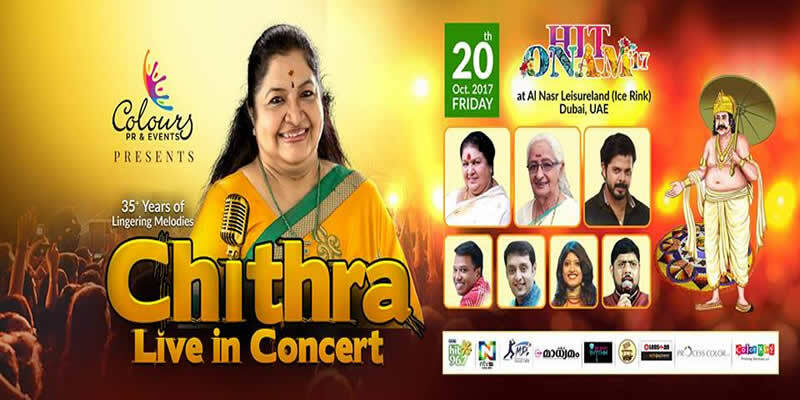 Chitra Live in Concert & Celebrating 35yrs of lingering melodies in Indian Film industry & Felicitating Motherly characters from Malayalam movie industry (Kaviyoor Ponnamma & Vatsala Menon) … followed by a beautiful musical extravaganza…. Terms & Conditions : All rights reserved by Organizer. This is your booking voucher. it will be replace by permitted ticket at venue. Best Viewed at 1024 x 768 pixels and above. This Page loaded in 0.04902 seconds on Fri, Apr 19, 2019 (06:51).